Castle Hill High School supports pupil voice. Castle Hill High School has seen the benefits of using Talking Mats to let pupils have their say and be involved in planning outcomes. Jenna McCammon, Speech and Language Therapist & Rebecca Highton, Speech and Language Therapy Assistant, Stockport NHS Foundation Trust explain how they are using Talking Mats at Castle Hill High School. Talking Mats has been beneficial in supporting young people with communication difficulties in school. A Talking Mats approach has been used to support a pupil who presents with selective mutism. He started refusing to engage in lessons and activities, so school wanted to find out what he enjoys doing and how best to support him. Talking Mats allowed the speech and language therapy team to find out about his likes and dislikes at school, along with the reasons why he was refusing to engage in certain lessons. The sessions allowed the speech and language therapy assistant to build rapport with the pupil through finding out what he enjoys both in and outside of school, and the pupil communicated verbally during one of the sessions for the first time since his change in behaviour. The speech and language therapy assistant took pictures of the finished piece of work and asked permission from the pupil to share this with school staff. The speech and language therapy assistant was able to feed back the outcomes with staff and with other professionals during TAC meetings. 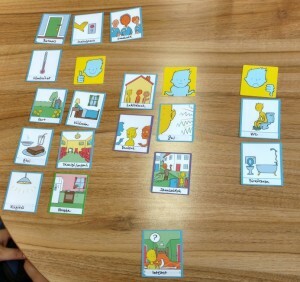 Staff and other professionals would then request if the speech and language therapy assistant could obtain more information from the pupil, when needed, using Talking Mats. Safeguarding – A possible safeguarding issue was suggested by a pupil during a therapy. The pupil has significant communication difficulties and so the information she was able to provide was very limited. The safeguarding officer in school requested if the speech and language therapy team could try to find out more. This was done us using Talking Mats, which allowed the pupil to share more information about the issue which was then shared with the safeguarding officer. Motivational Interviewing is a tool used by the speech and language therapy team, both when assessing a new referral and when completing a review assessment in order to set new therapy targets. It is an opportunity for the young person to express their opinion, and can also be used to determine how much insight they have regarding their communication abilities. This is usually done verbally using a 10-point scale, however Talking Mats has been used by the speech and language therapist when assessing pupils with limited verbal ability. This allows these pupils to voice their views and have a say in their therapy planning. The findings from the Talking Mats motivational interviews then contribute to writing EHCP Reports for the pupil and are used to inform the decision-making process regarding their therapy goals. Thanks to Jemma and Rebecca for sending these great examples. Change happens when we give young people a listening space. 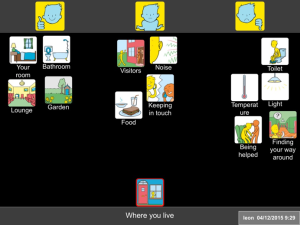 This entry was posted in Blog and tagged Children, Communication difficulties, GIRFEC, Participation, Personalisation, Talking Mats, Young people on July 27, 2016 by Margo Mackay. This blog summarises a project we have completed providing Talking Mats training for families living with dementia. A key aspect of the work done by Talking Mats is to find ways to improve communication for families living with long term conditions. In particular dementia is a long term condition where deterioration in communication will eventually affect everyone. This makes it increasingly difficult to ensure that the person with dementia continues to be involved in decisions about their life. We have completed a project funded by Health and Social Care ALLIANCE Scotland. 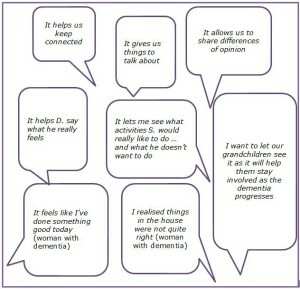 Training in the use of Talking Mats was given to families living with dementia and staff who worked with these families. 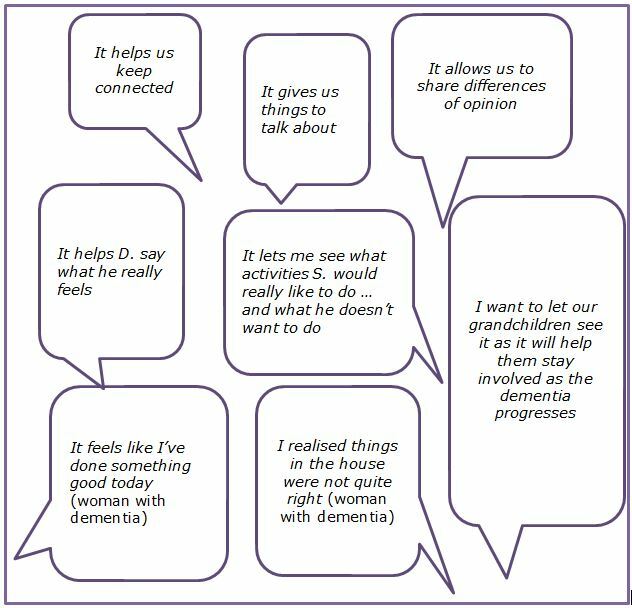 The Alliance Family Training final report highlights how this training helped people with dementia to communicate their views and be more involved in making decisions about their lives. For some family members an important outcome was that Talking Mats helped them see that their spouse was satisfied with many aspects of his/her life. They found this very reassuring as many assumed that the person with dementia was frustrated and discontented. The following is an example of how using Talking Mats helped with self-management. When using Talking Mats on the topic of Where you live, G explained that he found it difficult to find his way to the toilet in the night. As a result his wife bought special senior night lights to help him which solved their problem. As a result, night times improved for both of them. This entry was posted in Blog, Communication difficulties, Dementia, Participation, Self management, Training and tagged Communication difficulties, Dementia, Participation, Self directed care, Talking Mats, Training on July 8, 2016 by Joan Murphy. 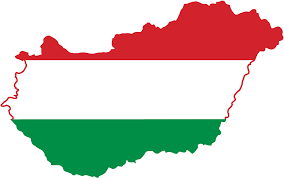 Thanks to Agnes Turnpenny for her guest blog on her research on views of people moving form institutional care in Hungary. There are approximately 15 thousand adults and children with learning disabilities living in large institutions in Hungary. The average size of these facilities is over 100 places, and living conditions as well as the quality of care are often very poor. The Hungarian Government adopted a strategy in 2010 to close and replace these institutions with smaller scale housing in the community. Between 2012 and 2016 six institutions closed and more than 600 people moved to new accommodation. The Mental Health Initiative of the Open Society Institute and the Hungarian Civil Liberties Union commissioned a study to analyse the experiences of the deinstitutionalisation process and as part of this research we carried out some interviews to explore the views of people moving out of the institutions. The participants – five men and four women – came from one institution in the North East of Hungary, they all had mild learning disability and some had additional mental health issues. Originally the study intended to explore the experience of moving out but due to delays in the project this was not possible. Instead, we decided to examine the expectations of moving from an institution to a smaller home that allows more independence and personalised support. Although only one of the participants had communication difficulties – thus conventional interview methods could have been utilised – I decided to use Talking Mats in order to help participants to contrast their current situation with expectations about the future. It emerged – unsurprisingly – from the interviews that most participants anticipated the improvement of their living conditions from the move, especially better facilities (mainly bathroom and kitchen). Some also expected other positive changes, particularly less conflict with other residents, less noise and better safety –commenting on the prevalence of theft in the institution. There were also many uncertainties; people said they were unsure about how they would get on with their new housemates, how the new support arrangements with staff would work, whether the neighbours will be welcoming etc. The photos illustrate some these issues. Overall, Talking Mats proved to be a very useful tool in interviewing participants, who really engaged with the method. The images and the completed mats encouraged further comments and explanations on issues that participants considered important with minimum prompting. The drawings were easily recognised and appropriate in the Hungarian context without any adaptations other than the labels. Finally, I felt that the use of Talking Mats in this particular situation helped to overcome some of the power imbalance between the researcher and the participants by giving them more control when handing over the images. We are really grateful to Agnes Turnpenny from The Tizard Centre University of Kent for sharing her experience . We really value our European work and European connections. This entry was posted in Blog, Learning disability, Research and tagged Communication difficulties, Learning Disability, Participation, Research, Talking Mats on July 1, 2016 by Lois Cameron.